Locating between terminal 1 and terminal 2, Shanghai Pudong International Airport Long Distance Bus Station is the best choice for people who land at the Airport with much carry-on luggage to travel for destinations such as Hangzhou, Suzhou, Wuxi, Yiwu and etc. It's easy to find. Having exited the international arrivals hall, you can just follow the airport guide signs and walk 10 to 20 minutes to Shanghai Pudong Airport Long Distance Bus Station directly. Even though the bus station is small and simple, it has good service. The waiting room is equipped with hot water fountains, drink and snack vending machines and the toilet rooms are well maintained. ☝ A guide sign at Shanghai Pudong International Airport. 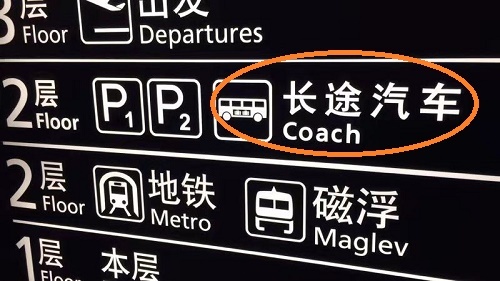 The one "Coach" we circled here is used to indicate Shanghai Pudong International Airport Long Distance Bus Station. 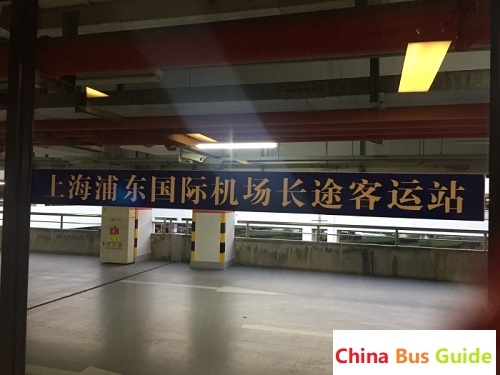 Shanghai Pudong Airport Long Distance Bus Station sells tickets online and passengers can submit booking inquiries to China Bus Guide to do advanced booking. It doesn't accept payment by credit card, Alipay, Wechat and etc. It doesn't accept payment by foreign currencies neither. To purchase bus ticket here, you will have to pay Renminbi cash. If you happen to have no Renminbi cash on hand, you can either exchange currency with people nearby or go upstairs to the 3rd floor to to do so through an agency. It is common to see people crowding at the ticket window to purchase their tickets, so please plan your schedule properly by taking the queuing time and etc into account. FYR, it takes 15 to 20 minutes to walk from Terminal 2 to the bus station. Its ticket entrances open 10 minutes before the scheduled departure and close 3 minutes in advance. People who want to go to Shanghai Pudong Airport from Suzhou, Hangzhou, Yiwu, Wuxi, Shaoxing, Kunshan and etc can reserve tickets through China Bus Guide.Com as well. Have you ever traveled from/to Shanghai Pudong Airport Long Distance Bus Station? We encourage you to share your travel experience and review their service by leaving your comment here to help other visitors travel smartly. You can also leave a question here to get fast response.